Figure A59. Mendocino anomaly, interpreted as the Mendocino slab, with (horizontal) [vertical] cross sections through (A)[D] the UUP07 p-wave) and (B)[D] the combined SL2013 and S40RTS s-wave models at 1510 km; C) the location of the modern geological record that we interpret to have formed during the subduction of the slab. 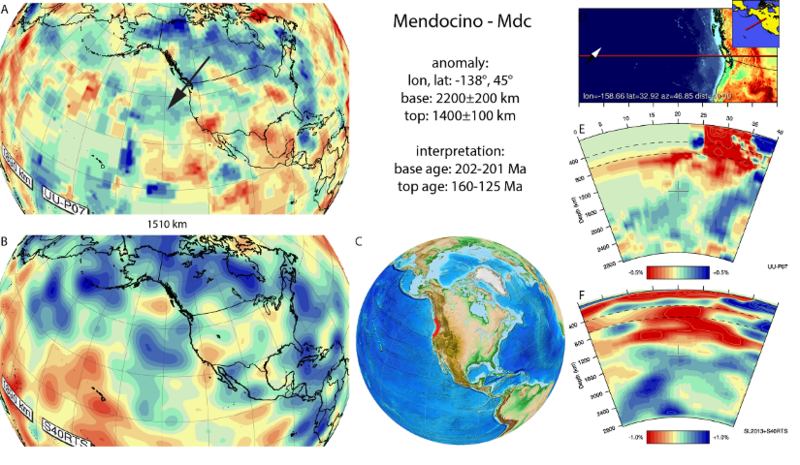 The Mendocino anomaly (Figure A59) is located in the lower mantle below the northeastern Pacific Ocean, west of the North American continental margin, west of the Hudson, Hatteras and Idaho slabs and south of the North Pacific slab. It was named ‘X’ by Sigloch (2011) and and later Cascadia Root 2 (CR2) by Sigloch and Mihalynuk (2013). Van der Meer et al. (2012) interpreted it as an (unnamed) slab remnant at 2300-1700 km depth in east-Panthalassa Ocean marginal subduction zones in the UU-P07 model (Amaru, 2007). Sigloch and Mihalynuk (2013), on the basis of a regional tomographic model of Sigloch (2011) interpreted the slab to extend to the top of the lower mantle. The age of subduction is poorly constrained from geological data. Sigloch and Mihalynuk (2013) interpreted subduction to have occurred between 140-75 Myr on the basis of plate tectonic reconstruction. The shallowest occurrence of the slab is close to the North American continental margin, suggesting terrane accretion might have occurred in Cenozoic times. This is consistent with the inferences of Sigloch (2011) and Sigloch and Mihalynuk (2013), who indicated final terrane accretions (Siletzia, Pacific Rim) at 55-50 Myr. However as discussed at the Idaho slab, the Siletzia terrane is mostly an oceanic plateau (Wells et al. 2014) and is not related to arc volcanism. We interpret the Idaho and Mendocino slab to be genetically linked and both resulting from intra-oceanic subduction at the Talkeetna-Bonanza arcs. Based on their present-day relative locations between these two slabs and arcs, we tentatively we suggest that the Mendocino slab is correlated with the Alaskan Talkeetna arc. This Alaskan arc was formed from 202-201 Ma onwards (Clift et al, 2004, Rioux et al. 2007). On the basis of rapid exhumation and deposition of the coarse clastic Naknek formation Clift et al. (2004) suggested it was possibly amalgamated between 160-125 Ma in the greater Wrangellia terrane. We here interpret these events to represent amalgation with the Bonanza and Gravina arcs, and correlated with the Idaho slab.